Lighting is the cornerstone of shooting on green screen. 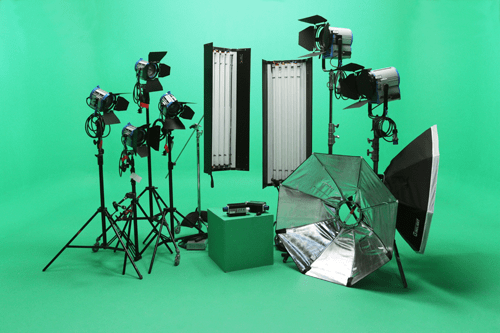 A well lit green screen will save time and money in the post production of a project and on the flip side a poorly lit green screen will cost time and money in post. The key to keying is having the green screen evenly lit. This is best achieved with big soft light sources. Hard light sources will cause problems with hot spots on the green screen which are a problem when trying to key the green screen out. They will also exaggerate any texture on the green screen which again will cause problems when keying. An ideal starting point for lighting greenscreen studios. Being a big soft source, they will do most of the work for you. 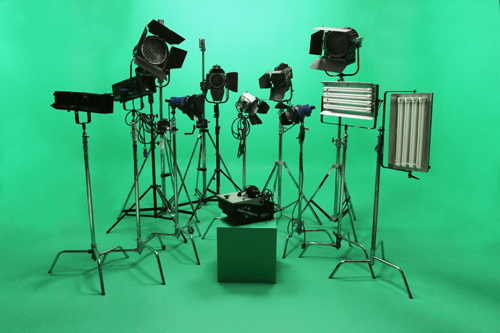 If additional lighting is required, Kinoflo’s or Filmgear tube boxes light banks are a great choice, their large lighting area is perfect for evenly lighting the green screen in areas that might need the extra lighting level. For best results it’s useful to have the space lights on dimmers. Once the lights are all up you need to check to make sure the light is even across the whole green screen. Any shadow areas can cause problems with the key, as they are less saturated with green and may approach a similar tone to shadow areas of the clothing any talent might be wearing. This will then result in the areas of clothing disappearing while trying to key out the shadow areas on the green screen. A light meter can tell you what areas of the screen might need some additional light. Another good way of gauging how even the lighting on the green screen is is to turn on the zebra on the camera and slowly open up the aperture. As the aperture opens up the green screen should all pick up the zebra stripes at the same time. If the green screen isn’t well lit then the green screen will zebra out at different f stops, this will show you where your problem areas of the lighting on the green screen are. Avoid creating any shadows or ,if you are creating shadows, make sure they are on a part of the screen you won’t be using – the shadows will cause problems with the key. Try to avoid creating hot spots on the green screen with the additional lighting, this can be avoided by using lighting angles to your advantage and also with sufficient separation from the background and letting the light naturally fall off before it hits the green screen. When lighting talent on a green screen a rim light will help separate the subject from the background and also has the added bonus of bleaching out any green spill coming from the background. Any green spill on the talent will add more time in post production to colour correct out. My go to for rim lighting on green screen is a kinoflo bank at a 45 degree angle each side behind the talent, this will give you a good full body rim light, is a lighting style I really like and will also light out a lot of green spill. Below is an example of this set up I used recently. One of the biggest challenges for a Director of Photography when shooting on green screen is to control the green spill on the talent. Green skin looks bad and is an instant giveaway that something has been shot on a green screen. To help control this spill, rim lighting can help but the most effective way is to stop the spill in the first place. The best way to do this is to use negative fill. This involves using floppies, drapes and black carpet to cover up any parts of the green screen not being used and act as a barrier between the talent and the green spill. The negative fill has the added bonus of creating extra contrast resulting in a more visually appealing final result. Having DIT on set for a greenscreen shoot is also a great help when lighting. You can shoot some test footage and quickly get a good idea of how the greenscreen will key and highlight any problems areas that need addressing early in the day before they cause any problems further down the production line. It’s much better to fix it at the start of the day before filming any talent than to find problem areas during the edit that could have been fixed during the shoot day. The main point to take away when lighting green screen is the need for the green cyc to be evenly lit. Getting the best possible result early in the production workflow will save time and money further down the line and produce better end results. Control green spill on the talent can be controlled with negative fill and rim lighting.